The British Virgin Islands moved on May 22 to establish a permanent shark sanctuary in its waters. The designation by the cabinet of the British overseas territory prohibits commercial fishing of all shark and rays species throughout the full exclusive economic zone. That area amounts to 80,117 square kilometers (30,933 square miles). The designation also bans the sale and trade of sharks and shark products within the territory. Many threatened or near-threatened shark species, including the oceanic whitetip, scalloped hammerhead, tiger, and Caribbean reef sharks, swim in the waters off the British Virgin Islands. By committing to these comprehensive and permanent conservation measures, the territory has established itself as a global leader in protecting the predators that are vital to the health of our ocean. Worldwide, an estimated 100 million sharks are killed each year in commercial fisheries. As a result, theInternational Union for Conservation of Nature’s Red List of Threatened Species says that more than half of all sharks and sharklike species are threatened or near-threatened with extinction. The announcement fulfills the commitment made by the territory’s premier, Dr. the Hon. D. Orlando Smith, OBE, during a 2013 meeting of the Caribbean Challenge Initiative on regional protections for sharks. The British Virgin Islands now joins The Bahamas and Honduras, which declared shark sanctuaries in 2011, as the first Caribbean governments to implement these types of measures. In addition to the British Virgin Islands, the Caribbean Challenge Initiative is made up of island governments dedicated to a shared vision and course of action for the region’s marine and coastal health. Other members include The Bahamas, the Dominican Republic, Grenada, Jamaica, Puerto Rico, Saint Kitts and Nevis, Saint Lucia, and Saint Vincent and the Grenadines. 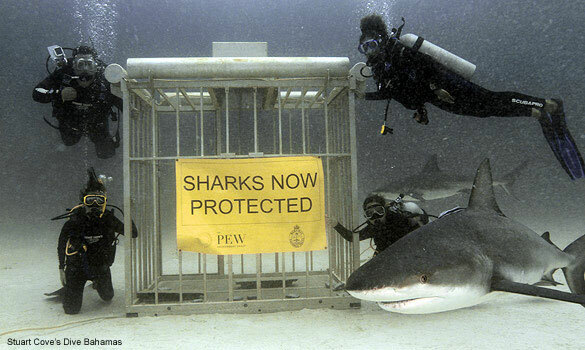 The parties have committed to establishing regional shark protections by May 2015. The British Virgin Islands is home to some of the region’s most spectacular reefs. Sharks play an important role in maintaining the balance of the ocean environment. As top predators, they regulate the variety and abundance of species in the food web, including commercially important fish species. Sharks also help to maintain healthy marine habitats, such as coral reefs. The loss of sharks could cause irreversible damage to the ocean and economic activities that benefit from these habitats. By establishing a shark sanctuary, the British Virgin Islands is taking steps to strengthen the marine ecosystem, including reefs, and helping to secure industries that depend on a healthy ocean.